The electrified 2.0-liter is joined by a new 1.6-liter billed as being Kia's cleanest diesel ever. It was only last week when our spies caught on camera a camo-free prototype of the 2019 Sportage and now Kia has dropped the first official images and details about its updated compact crossover. As you would come to expect from a press image, the version depicted in the adjacent shots is the range-topping GT Line, sporting a slightly updated exterior design. Perhaps the most obvious change is at the front where the Porsche-esque “ice cube” LED fog lights have been replaced by a different set as part of the reworked front bumper with large trapezoidal “air vents” shaped sort of like a pentagon. The four-point lighting motif hasn’t been dropped altogether as it can now be seen in the revamped headlights. The corporate “tiger nose” grille of the GT Line version now features a slightly updated glossy finish with a “hot-stamped” look while below sits a mildly revised silver skid plate. There’s also a new prominent horizontal fin slicing the two air vents in half and extending onto the center of the bumper. 2017 Kia Sportage | Why Buy? The side profile reveals a fresh wheel design for the 19-inch set exclusive to this trim level. Kia mentions it has created new alloys for all versions of the Sportage, ranging in size from 16 to 19 inches. Moving at the back of the car, the updates are less obvious and nothing to write home about, but we do mention the discreetly tweaked taillights and a new silver skid plate. Stepping inside the cabin, you’re being greeted by a new steering wheel and a modified instrument cluster. Kia is adding a new two-tone (black and grey) upholstery not just for the lesser versions, but also for the GT Line model in which the seats are clad in leather. The seats shown here are covered in the optional black leather with red contrasting accents. By far the most important novelty is represented by the new four-cylinder EcoDynamics+ 2.0-liter “R” powertrain. It’s a four-cylinder turbodiesel featuring a mild-hybrid starter/generator unit and a 48-volt battery. Under the new and more stringent Worldwide harmonized Light vehicles Test Procedure (WLTP) regulations, it cuts CO2 emissions by as much as four percent. You can say goodbye to the old 1.7-liter CRDi as Kia is replacing it with its new 1.6-liter U3 CRDI described as being the company’s cleanest diesel engine to date. It’s available either with 113 hp or 134 hp, with the high-power version offered with all-wheel drive and a dual-clutch, seven-speed automatic transmission. This engine was launched earlier this year on the European-spec Optima where it replaced the same 1.7-liter unit. Rounding off the updates is the inclusion of smart cruise control with stop & go functionality, Driver Attention Warning system detecting driver fatigue and inattentiveness, along with an Around View Monitor to help you out while parking. Depending on version, the 2019 Kia Sportage will be available in Europe with the firm’s latest 7-inch touchscreen or the new “frameless” 8-inch display. Kia will kick off customer deliveries of the 2019 Sportage in Europe during the third quarter. Kia Motors has revealed the New Kia Sportage, introducing a range of enhancements to the brand’s UK, European and global best-seller. The new model pairs an updated exterior and interior design with new safety and infotainment technologies. Powertrains are also fully-compliant with future emissions standards. The Sportage’s advanced new EcoDynamic+ 48V diesel mild-hybrid powertrain is the first to be launched as part of the brand’s global powertrain electrification strategy. Kia is the first manufacturer to offer hybrid, plug-in hybrid, battery-electric and 48-volt mild-hybrid technology across its full model line-up. Kia will launch 16 advanced powertrain vehicles by 2025, including five new hybrids, five plug-in hybrids, five battery-electric vehicles and, in 2020, a new fuel-cell electric vehicle. Kia sold more than 131,000 examples of the Sportage in 2017, representing a quarter of the brand’s total European sales. In the UK, the Sportage continues to be the brand’s biggest seller with 39,683 delivered to customers in 2017, making up over a third of UK sales last year. Updates to the Sportage range also include modifications to ‘GT-Line’ models. European customer deliveries of the new model will start during Q3 2018. The Sportage now offers a wider range of engines, including Kia’s new ‘EcoDynamics+’ 2.0-litre ‘R’ diesel mild-hybrid powertrain. EcoDynamics+ supplements acceleration with power from a 48-volt battery, and extends engine ‘off time’ with a new Mild-Hybrid Starter-Generator unit. It can reduce CO2 emissions by up to four per cent on the Worldwide harmonized Light vehicles Test Procedure (WLTP). The Sportage’s existing 1.7-litre CRDi (Common-Rail Direct injection) diesel engine has been replaced with Kia’s efficient new 1.6-litre ‘U3’ CRDi engine, the cleanest diesel engine Kia has ever made. The new 1.6-litre diesel engine produces 115 or 136ps, with higher-powered models available with all-wheel drive and seven-speed double-clutch transmission. All powertrains are now fully compliant with the Euro 6d TEMP emissions standards. 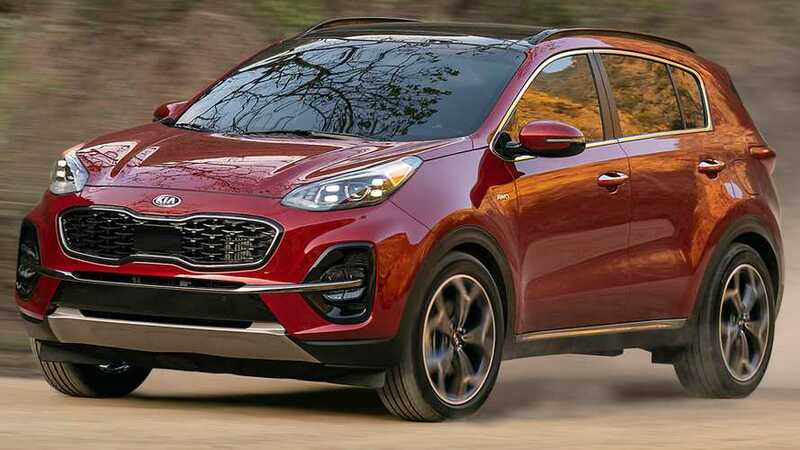 Improvements to the Sportage’s sporty exterior design include new front and rear bumpers, as well as redesigned front and rear lamps and new 16-, 17- and 19-inch alloy wheel designs. Options include chrome sill trim and metallic skid plates, and five new paint colours. ‘GT-Line’ models are equipped with a gloss black hot-stamped radiator grille, a gloss black and silver skid plate, and dark chrome inserts on the side sills and rear tailgate. The GT-Line’s unique 19-inch alloy wheels have been redesigned, and all models are fitted with a dual exhaust rear valance and revised ‘ice cube’ LED fog lamp designs. The newly-refined cabin features a new steering wheel and revised instrument cluster, as well as new black-and-grey two-tone upholstery. ‘GT-Line’ models are available with new black-and-grey two-tone leather seats, or optional black leather with red accents. 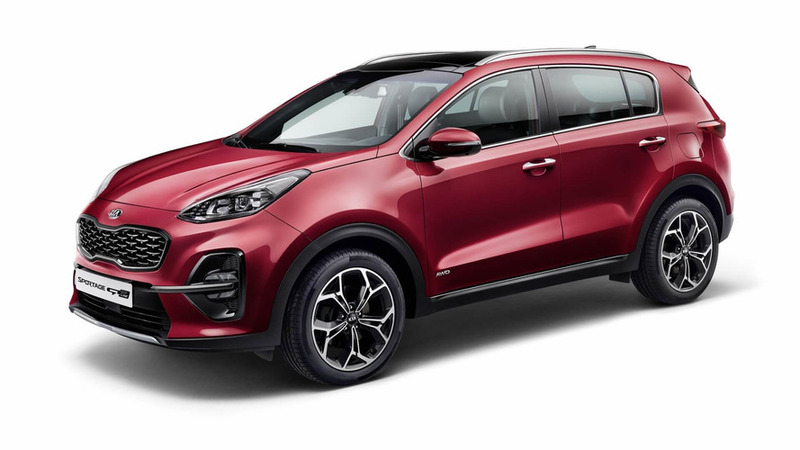 The new Sportage adopts Kia’s latest advanced driving assistance systems, including Smart Cruise Control with Stop&Go, an Around View Monitor for easier parking manoeuvres, and Driver Attention Warning, to combat fatigue and inattentiveness at the wheel. European customers have a choice of Kia’s new infotainment systems: a 7.0-inch touchscreen, or a new ‘frameless’ 8.0-inch infotainment system. UK on-sale date, pricing and specification will be announced in due course.